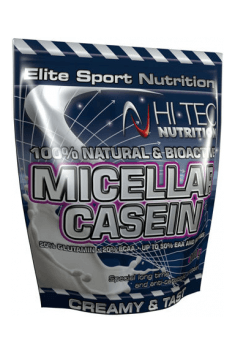 Micellar Casein is a carefully filtered, not denatured (i.e. natural taste) milk protein, whose biological value and quality of amino acid synthesis (BV, PCDAAS, BY) clearly out performs other commercially available acidic caseins or casein products. The special composition of 10% alpha Lactoglobulin, 10% beta Lactoglobulin, 40% alpha S-Casein, 30% beta Casein and 10% Kappa Casein, the amino acids and peptides of Miclellar Cassein are evenly released into the blood stream 30 minutes after consumption up to 8 hours after consumption. Micellar Casein is a very creamy and tasty protein, which is absorbed slower than all the other proteins so you can benefit from an 8 hour supply of muscle building material. The long lasting amino acid release prevents anti catabolic effects (unless you eat anything else over night). Micellar Casein is for many athletes a night protein and is taken before bed time. However, there are athletes that prefer an easily digestible, quickly absorbable protein such as Anabolic Protein Fusion, Whey fusion or free amino acids, so as not to stress the organism over night with digesting activities. So it is advised to test out which amino acid supply is best for you. Micellar Casein causes a long continuing saturated feeling and is suitable as a meal replacement during a diet. Since diet is connected to calorie-reduced nutrition often with muscle and loss of power, here the anti-catabolic factor can be particularly interesting. Micellar Casein contains nearly 50% of essential amino acids (EAA) over 20% branched amino acids (BCAA), 20% of glutamine and above average 3.5% arginin, a higher-quality amino acid profile than the above-mentioned forms of casein or caseinates. Milk proteins (97.6% for vanilla flavor, 92.7% for chocolate flavor), cocoa (for chocolate taste), thickener: xanthan gum, acidity regulator: citric acid, sweetener: (sodium cyclamate, sodium acharyniate), flavor anti-caking agent: calcium phosphate.